Radical state action is the answer to Britain’s housing crisis wrote Andrew Adonis yesterday. He went on to mention London five times. Not once did he refer to another city of the United Kingdom. Dr. Adonis went to school near Oxford. He did his degree in Oxford. He did his Doctorate in Oxford. He took a fellowship in Oxford. And then he moved to London. His education should have taught him what his experiences could not, that London is a small part of Britain and not the whole of it. The first sentence of the article pronounced that "the heart of Britain’s housing and growth crisis is the failure to build anywhere near enough homes...". In London and the South-East of England that is undoubtedly true. We must urgently start building more and better homes in and around London. But what about in the majority of Britain, away from the small corner that Dr. Adonis has always called home? Is the failure to build enough homes at the heart of the growth crisis affecting Swansea, Middlesbrough, and Blackpool? Is a lack of new homes the top priority in the more succesful cities of Manchester, Leeds, Birmingham, and Newcastle? In Leeds and Bradford good quality family homes can be bought for less than £100k and excellent city-centre offices like mine can be rented for less than £100 per person per month. 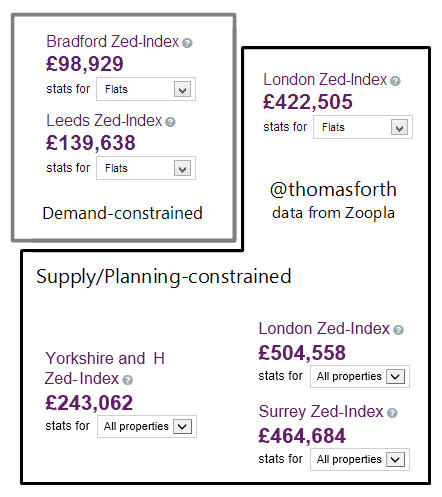 In Leeds and Bradford, land and planning permission is widely available for more homes, offices, and shops. The problems that afflict the world Andrew Adonis knows are not the ones that affect us most severely. 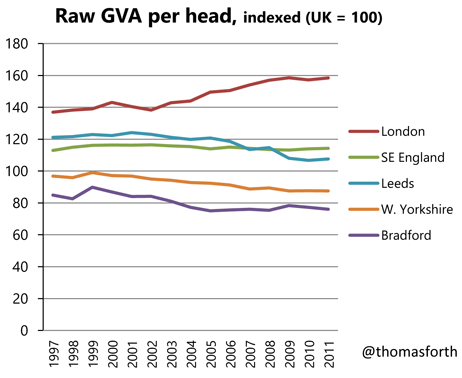 The heart of the growth crisis in Leeds is a failure to generate enough demand, not a failure to build. Roads and trains are more congested than in London and competing bus companies provide an incomprehensible, infrequent, unreliable, painfully slow, and expensive service. The city's provisions for cycling are rudimentary and the city remains the largest in Europe without a public transport system. A rapidly growing airport within sight of two train lines remains disconnected. The overcrowded train to Manchester Airport takes over an hour and a quarter to travel just over 40 miles. Politicians like Dr. Adonis have for nearly a century sat in London offices and diminished, obstructed and cancelled plans to connect Leeds with itself and with its neighbours. Potential agglomeration dividends are squandered everyday and agglomeration benefits within the region and beyond it to nearby Manchester and Sheffield remain unrealised. 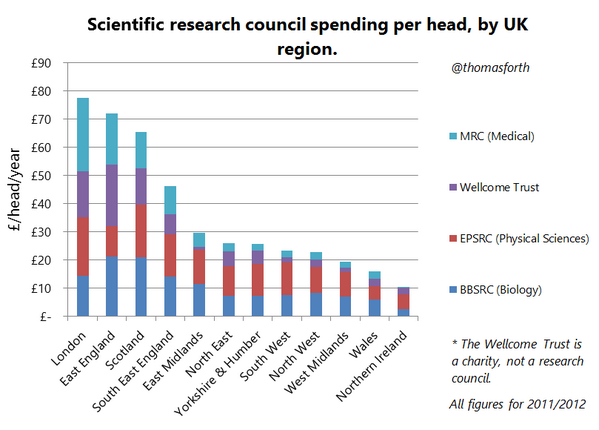 In the city which last year celebrated the centenary of its nobel-prize winning invention of X-ray crystallography, and this year hosts the Tour de France's Grand Départ, government investment in science and technology and transport infrastructure is pitifully small compared to the overheating South-East. Investment in arts and culture that would feed into and stimulate the region's strong creative industries are similarly pathetic. A government getting to the heart of this growth crisis would invest more heavily in Leeds and Manchester where planning restrictions are loose than it does in London where opposition to expansion is high. A government getting to the heart of this growth crisis would push as hard to improve education in West Yorkshire as it did with the London challenge. It would spend the same per head improving the public amenities in West Yorkshire as it did sprucing up the capital for its Olympics. Instead this government, like Dr. Adonis' before, has taken the North for granted. Even at the moment of this City's greatest modern triumph the government in London tried to sabotage our succesful bid for the Tour de France's Grand Départ and claim it for England. The heart of Leeds' problems — in common with much more of Britain — lies elsewhere.